Basic Response - Click Image to view full size. Compliance Inspection - Click Image to view full size. EMS Procedures - Click Image to view full size. Incident Report - Click to view full size. 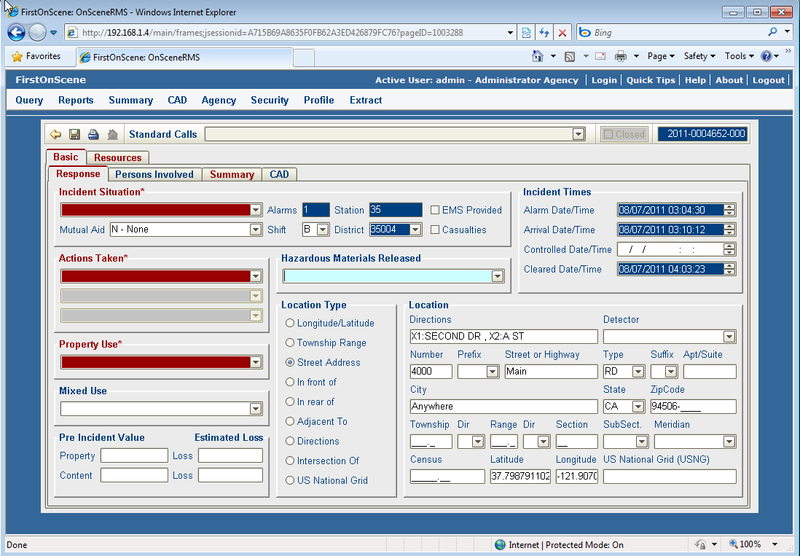 OnSceneRMS is an “off the shelf” Fire Records Management Product Suite. 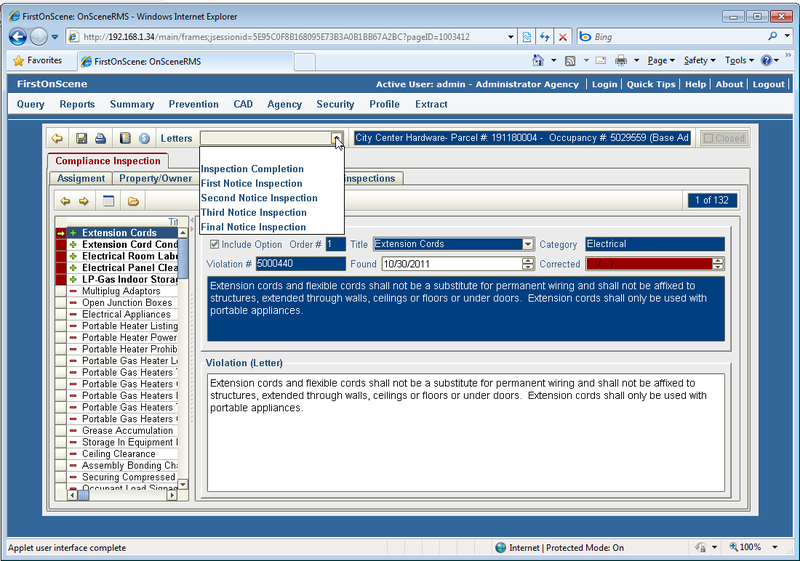 The OnSceneRMS is fully compliant with the NFIRS 5.0 Design Documentation and is NEMSIS Gold Compliant. FirstOnScene combines sophisticated engineering with a service-oriented business approach to offer a cost-conscious department a product suite with a very good Return On Investment. 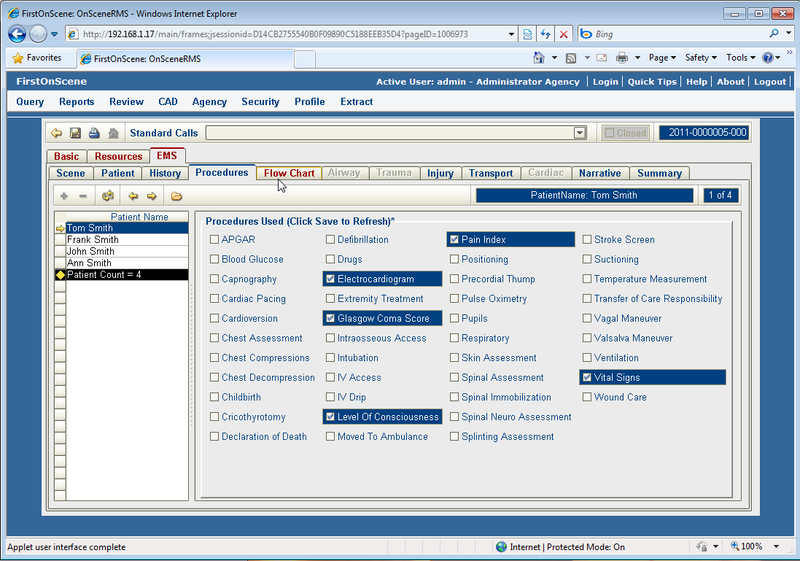 OnSceneRMS uses the Microsoft web browser Internet Explorer to provide a user with a full featured, easy to use interface, with the goal of minimizing department training costs. Most powerful web interface available. FirstOnScene is a company with one focus: building the best fire department RMS on the market at the lowest possible price. FirstOnScene was founded in 2003 with the goal of creating a state of the art web-based Records Management System: OnSceneRMS. OnSceneRMS is in active use at some of the largest fire departments in the country and designed to work in fire departments handling 5,000 incidents a year to fire departments handling 500,000 incidents a year. OnSceneRMS includes a real-time CAD interface, Incident Reporting, Advanced EMS reporting, Fire Prevention and Training records. All these modules use a consistent and easy to use web-based interface that has all of the functionality of a traditional desktop application. FirstOnScene Customer Support is driven to ensure OnSceneRMS meets a department’s operational needs. FirstOnScene knows that engineering and customer support need to be tightly integrated and that integration drives a very high level of customer support. Customer support isn’t only about responding to issues; FirstOnScene takes a proactive approach – verifying that OnSceneRMS is operating within designed parameters and alerting a customer if an issue is discovered. 24×7 Customer Support is what you expect and that is what FirstOnScene delivers. FirstOnScene combines state of the art database technology (Microsoft SQL Server 2008 or Oracle 11g) with the most powerful web-based interface available to deliver a truly advanced, easy to use application: OnSceneRMS. Most web interfaces seem lacking compared to a desktop application, but not OnSceneRMS. Using sophisticated web technology OnSceneRMS combines the power of the web browser with the interactivity of a desktop application – delivering what you always expected from a web-based system. Technology is changing very rapidly and a department invests in an RMS expecting a minimum 10 year operational life. Over the next 10 years applications will become more Internet and web browser oriented. Why wait? OnSceneRMS delivers that today. OnSceneIncident is a NFIRS 5.0 rules based system that automatically creates the additional required fields as the user completes a report, effectively guiding users through the incident reporting process. This ease of use results in short training times, promotes NFIRS compliance and improves data collection. 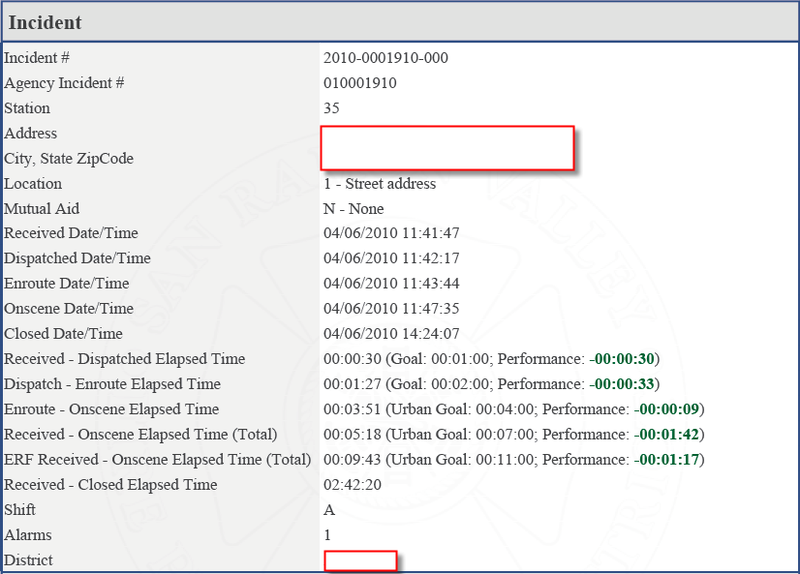 OnSceneIncident also captures all CAD data allowing a department the full picture of an incident. OnScenePrevention is a fully integrated fire prevention module combining: Occupancy management, Operational Permits, Compliance Inspections, Construction Plan Reviews, Construction Permits and Inspections with an integrated Invoicing module. OnScenePrevention allows a department to efficiently create and manage all correspondence using PDF forms tied to a database oriented archival system. OnScenePrevention supports using the spatial database functionality to allow managing inspections in a real-world manner (e.g. find all inspections with a half-mile of a given business or address). OnSceneEMS is an ALS level, NEMSIS Gold compliant, EMS module. Fully integrated with the OnSceneIncident module it is a protocol driven system that automatically adds required fields, enforcing EMS policies, and guiding a user through the patient treatment reporting process. OnSceneEMS is designed to handle incidents with multiple patients and is compliant with HIPAA regulations. OnSceneEMS supports a double-blind peer review PCR system allowing a department near real-time QA/QI (suppressed patient name and reporting officer). OnSceneTraining is an ISO oriented training module designed to help a department reach its training and ISO goals. OnSceneTraining supports a Credential based archival system that allows a department to manage firefighter credentials in an efficient way. OnSceneTraining supports a “draft” field-based reporting approach allowing a firefighter to enter their training data into a preliminary database that requires a Training officer to approve each training report before it is added to the department’s official training database.